Common Question: What’s the deal with the Lutheran doctrine of baptism? “Why can’t women be ordained in the Lutheran Church – Missouri Synod?” “How does evolution square with the biblical record of creation?” “We confess in the Apostles’ Creed that Christ ‘descended into hell.’ Where does it teach that in the Bible?” I receive questions such as these – as well as many others – about why Lutherans believe and teach what they believe in teach. So periodically, over the course of the next several weeks and months, I will be taking some time to answer some of the most common questions I regularly receive about Lutheran doctrine. Today, we begin with a question that is perhaps the most ubiquitous of all: “What’s the deal with the Lutheran doctrine of baptism?” Before we dive into this doctrine, it is important to clarify two things. First, I believe the Lutheran doctrine of baptism is the Christian doctrine of baptism. That is, I believe that the Lutheran doctrine of baptism is what Scripture itself teaches. Second, I am fully aware that many sincere and godly Christians differ over the doctrine of baptism. As I discuss this doctrine, then, I do so in a spirit of humility, respecting and loving those with whom I disagree. I do not, however, discuss this doctrine with a spirit of relativism, believing that different teachings on baptism are equally true or that what we believe and teach about baptism makes no difference. Quite the contrary. If the doctrine of baptism matters to the authors of Scripture, it should matter to us. Therefore, we should consider carefully what they teach. Baptism is a divine ordinance, instituted by Christ Himself, whereby He makes disciples through water combined with God’s name. Jesus says, “Go and make disciples of all nations, baptizing them in the name of the Father and of the Son and of the Holy Spirit” (Matthew 28:19). The participle “baptizing” can be translated as a participle of means. 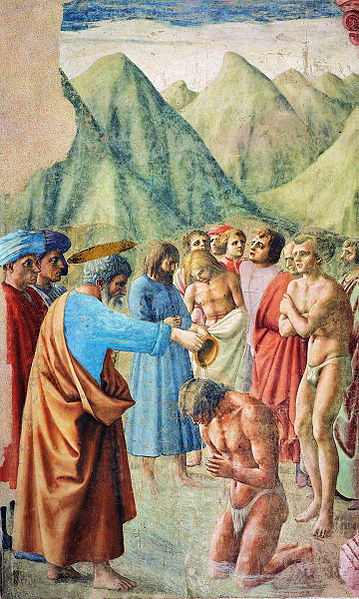 Baptism, therefore, is a means by which disciples are made. It is important to recognize that baptism is something God does for us and not something we do for God. This is why Paul says of baptism, “We were therefore buried with Christ through baptism into death in order that, just as Christ was raised from the dead through the glory of the Father, we too may live a new life” (Romans 6:4). Notice the passive voice of the verbs: “buried,” “raised.” These are divine passives, indicating that God is the One burying our old, sinful natures and raising us to new life in Christ. We are passive in the matter. This runs contrary to the teaching of some who describe baptism merely as an act of obedience while denying its divine power. Consider this quote from a large denomination’s confessional statement: “Baptism is an act of obedience symbolizing the believer’s faith in a crucified, buried, and risen Saviour, the believer’s death to sin, the burial of the old life, and the resurrection to walk in newness of life in Christ Jesus.” Two things are especially notable about this statement. First, while obedience is emphasized, the blessings of baptism are not mentioned. Second, this statement references Romans 6:4, but relegates Paul’s language concerning burial and resurrection to that of symbolism, emphasizing the believer’s faith rather than God’s action. Paul, however, nowhere indicates that he is speaking symbolically in this verse. Rather, his language indicates that he has a lively confidence in an actual new life, offered by God through baptism. Yes, baptism does save. Peter writes, “Baptism now saves you also – not the removal of dirt from the body but the pledge of a good conscience toward God. It saves you by the resurrection of Jesus Christ, who has gone into heaven and is at God’s right hand – with angels, authorities and powers in submission to Him” (1 Peter 3:21-22). Peter could not be clearer: Baptism saves you. However, it is important to note not only that baptism saves you, but how baptism saves you. It saves you “by the resurrection of Jesus Christ.” Without the resurrected Christ, baptism is emptied of its power and promise. There are some who object to the teaching that baptism saves, saying, “Faith in Christ alone saves you!” They often quote Scripture passages such as Romans 10:9: “If you confess with your mouth, ‘Jesus is Lord,’ and believe in your heart that God raised him from the dead, you will be saved.” They then argue: “Paul says that faith in Christ saves you and nowhere mentions baptism in Romans 10:9. Therefore, faith in Christ, and not baptism, saves you.” This type of argument deeply disturbs me because it engages in what I call “Bible Verse Battleship.” In this sad game, people line up their favorite Bible verses to support their favorite pet positions and then, when shown Scriptural testimony which calls into question their position, rather than seeking to reconcile the verses and take into account the whole counsel of God’s Word, they simply declare, “Because my pet Bible verse is true, you must be incorrect! My Bible verse sunk your Bible verse!” We should never use Bible verses to “sink” other Bible verses. Rather, we should assume that all Scripture as speaks with one, harmonious, voice concerning the one, true Christian faith. Thus, when Peter says, “Baptism now saves you” (1 Peter 3:21), we ought to take his words as complimentary, and not contradictory, to what Paul says in Romans 10:9. So then, how do we understand Romans 10:9 and 1 Peter 3:21 harmoniously? Like this. Baptism does not save simply because it’s baptism, but because it has the promise of Jesus’ presence attached to it (cf. Matthew 28:19-20). This is why baptism is regularly referred to as a “means of grace.” God works through simple things such as water in baptism, bread and wine in the Lord’s Supper, and words on a page in Holy Scripture to speak to, meet with, and provide gifts for His people. Martin Luther explains wonderfully: “Without God’s word the water [of baptism] is plain water and no baptism. But with the word of God it is a baptism, that is, a life-giving water, rich in grace, and a washing of the new birth in the Holy Spirit.” Thus, to say that baptism saves you is simply to say that Jesus saves you because Jesus is doing His work in and through baptism! Why do Lutherans baptize infants? Lutherans do not baptize infants. Rather, we baptize people in accordance with Christ’s commands to baptize “all nations” (Matthew 28:19). The Bible teaches that all are born into sin and deserve God’s condemnation (cf. Psalm 51:5). Therefore, babies need the salvation Jesus gives in baptism just as much as adults do. The Bible nowhere prohibits baptizing babies. In fact, we are told specifically that the promise of baptism is indeed for children: “The promise [of baptism] is for you and your children and for all who are far off – for all whom the Lord our God will call” (Acts 2:39). There are some who maintain that a profession of faith must precede baptism. And because a baby cannot profess his faith in Christ, he should not be baptized until he is old enough to make such a profession. In response to this objection, I would point out two things. First, I would question the assumption that a profession of faith is a necessary prerequisite of baptism. It often happens that that a person in Scripture confesses his faith before he is baptized, but common occurrence doesn’t always necessarily indicate a divine mandate. Just because the Bible offers a description of certain things and events (e.g., a person offering a profession of faith before baptism) does not necessarily mean that the Bible is mandating a universal prescription. Second, I would question the assumption that children cannot confess their faith. The Psalmist reminds us, “From the lips of children and infants You have ordained praise” (Psalm 8:2, cf. Matthew 21:16). Children can and do praise God, even if it is with broken grammar and babble. Finally, from a historical perspective, from the early days of the Christian Church, it was common practice to have parents or sponsors confess the Christian faith on behalf of their children. The Roman theologian Hippolytus writes this concerning baptism in AD 215: “Baptize first the children, and if they can speak for themselves let them do so. Otherwise, let their parents or other relatives speak for them.” I have written more about infant baptism here: http://bit.ly/qHp97b. Baptism is a joyous gift from God. For through it, God meets us with His gifts. Luther sums up the joy and promise of baptism nicely when he writes: “We see what a very splendid thing baptism is. It snatches us from the jaws of the devil, makes us God’s own, restrains and removes sin, and then daily strengthens the new man within us.” Thus is the blessing and gift of baptism! “The Baptist Faith and Message,” VII. Luther’s Small Catechism, “Baptism,” 3. What Luther Says, Ewald M. Plass, ed. (St. Louis: Concordia Publishing House, 1959) 61. Entry filed under: Common Questions. Tags: Baptism, Baptism Saves, Baptismal Regeneration, Baptists, Believers Baptism, Christianity, Hippolytus, Infant Baptism, Luther, Religion, Spirituality.